The arrival of the autumnal equinox this Saturday (Sept. 22) signals a transition from northern summer to fall in an astronomical sense. But it also signals the start of aurora-watching season. From now through the end of October, the chances of sighting the glow of the mysterious northern lightswill be reaching a peak. In fact, auroras peak in frequency twice a year, with the other peak coming in the weeks before and after the Vernal Equinox, which marks the beginning of spring in the Northern Hemisphere. But why are aurora displays more common around the time of the equinoxes? In fact, geomagnetic disturbances are almost twice as likely in spring and fall compared with winter and summer, according to 75 years of historical records analyzed by solar physicist David Hathaway of NASA’s Marshall Space Flight Center in Alabama. Such disturbances are usually the cause for aurora displays. According to solar astronomers, the sun is currently ramping up toward a cyclical peak in solar activity. Such peaks occur on average about every 11 years. The most recent solar maximumwas in 2000. The next maximum should arrive in early 2013 and will be one of the weakest since 1928. 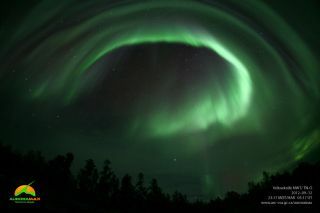 Nonetheless, with the times around the equinox statistically offering better-than-average potential of a geomagnetic disturbance, and with solar activity approaching its peak, any possible enhanced activity on the sun in the coming days and weeks might lead to a stunning northern lights display. We can't tell you precisely where to watch and we can't print a time table for any specific viewing spot on Earth. But we can tell you to watch for certain signs. If your newspaper, radio or TV reports that shortwave radio communications have been disturbed or interrupted, and especially if they say this had to do with something happening on the sun, or if you're a trucker and notice unusual skip conditions on your CB radio, then, that night, the next night and even the next, get out away from city lights and look up toward the north. Solar astronomers observe the sun daily and continually. Special techniques allow these specialists to detect explosions on the sun's surface called flares. These explosions can range from weak to stupendous. We see a flare as a rather sudden brightening of an area near or among sunspots. A small solar flaremight brighten for 20 minutes and then take another 40 to 60 minutes to fade. A great flare may take an hour or more to brighten, not fading away until three or four hours later. A flare is noticed as a brightening in ultraviolet and x-radiation as well as in visible light. These atoms are temporarily stripped of some of their electrons by the collision or near-collision, and the atoms absorb energy in the process. Such charged atoms are called ions. Within a millionth of a second the atoms regain their lost electrons and re-emit this energy in the form of light of various colors. In fact, there is always an overload of electrified particles sent to us, but after taking about 20 to 40 hours to traverse the 93 million miles between the sun and Earth, they become very much affected by our planet’s magnetic field. Instead of penetrating any part of our air then, they flow toward the regions of the north and south magnetic poles, where the night sky glows eternally with solar overcharge. The aurora at the northern magnetic pole is called Aurora Borealis, while the one at the southern magnetic pole is called Aurora Australis ("Southern Lights"). One must remember that the electrons that are lost fly around as negatively charged particles; the absorbing of the solar flare's ultraviolet and x-radiation creates more ions and more electrons. This greatly changed condition is responsible for influencing shortwave and CB radio signals, providing us with the clue to look for the Northern Lights. It's hard to adequately describe a striking auroral display — there are so many kinds. Arcs of light can extend for hundreds of miles or kilometers and start at the horizon and spread upward; long, thin streamers and rays extend toward the zenith and form curtains of light. Usually, an aurora's first appearance is subtle. You might first spy it as an eerie glow low in the northern sky — now here, now there, oozing silently from place to place. Often, its color appears whitish, but occasionally might also be red or green. Shooting up from this amorphous glow, rays or streamers might evolve, or perhaps curtains seemingly waving in an immense breeze. Like the all-combining search-lights of the navies of the world." Another way that you can anticipate an aurora is to check the latest space weather forecast from the NOAA Space Weather Prediction Center. This graph is updated every five minutes. Pay particular attention to the red graph. When you see a spike, a flare has taken place. If it spikes in the "C" column, the chances of it producing an aurora can be rated as "fair to poor." If it spikes in the "M" column, the chances improve to "fair to good." And if the spike reaches into the "X" column, the chances of catching sight of an aurora improve further to "good to excellent." The higher up a spike goes on the graph, the more potent the subatomic particle stream will be and the better your chances of seeing an aurora are. Of course, the farther north you're located, the better the odds of you actually sighting an aurora. Obviously, if you live in, say, Florida, the odds of making a sighting are much lower than for someone living in Maine or Quebec. Still, auroras are possible even over southerly latitudes. If a stupendous flare erupts on the sun, the zone of visibility for seeing an aurora, which is normally positioned over northern Canada and Alaska, can be pushed far to the south. As this index increases, the southern edge of auroral visibility moves southward. A K-index of 3 indicates that any auroral activity will be confined to central and southern Canada. A K index of 5 suggests that activity might be glimpsed over the Northern Plains, upper Great Lakes and northern New England. If you see the K index reach 7, it could be that an aurora might be seen as far south as New York, Chicago and the Central Plains States. And if the index soars to 8 or 9, then quite possibly the Northern Lights might shine all the way down into the Deep South. Such displays, however, most always occur only when a flare spikes into the "X" category. Hopefully, we'll see this type of activity in the days to come.